Oh yay! I am so glad you joined the ORC and I am in love with your plan! Oh a pantry!!! This is the first time I’ve seen one of those- so fun and what a space…I’m more than a little jelly over all that storage space!!!! Excited to see your transformation! A pantry is such an original space to makeover! Looking forward to all of the organization ideas you will implement. Your inspiration mood board looks great….can’t wait to see how it turns out. Thank you Frances! I cleared out the space last night and can’t wait to get started today! Can’t wait to see how it turns out! LOVE the inspiration board and colors! Also very excited to hear about the penny tile and how it goes for you- I’ve been looking for places to add it into my house as well : ) Good luck friend! What I wouldn’t do for a walk-in pantry! I love it. I love your ideas too. Can’t wait to see the progress~! Thanks Erin! Most of my plan will work just as well in a smaller space! What a fun pantry space this is going to be. I cannot wait to see your progress and how it all unfolds. I too am participating in the One Room Challenge. My challenges? I just moved to a completely new state (Texas) last week and therefore have no idea where to source things other than Wal Mart and Home Depot. 🙂 I am currently battling strep throat and just want to lay around and eat soup as opposed to painting a 30 year old polyurethaned oak coffered ceiling that has never before seen paint. The accompanying powder room rivals the worst gas station stall ever. But a bonus is that the previous owners installed a wine glass and bottle holder on the ceiling of the bathroom. I kid you not. Come take a peek. Oh my gosh!!! I will absolutely be by to check out the wine bottle holder in the bathroom. And yikes! Trying to do the challenge in a new state will be an adventure for sure. Luckily Texans are pretty serious about their shopping, so you should find some amazing new sources. I’m your neighbor to the north (Oklahoma) and have to take occasional shopping trips to Dallas just for basics like IKEA and World Market! 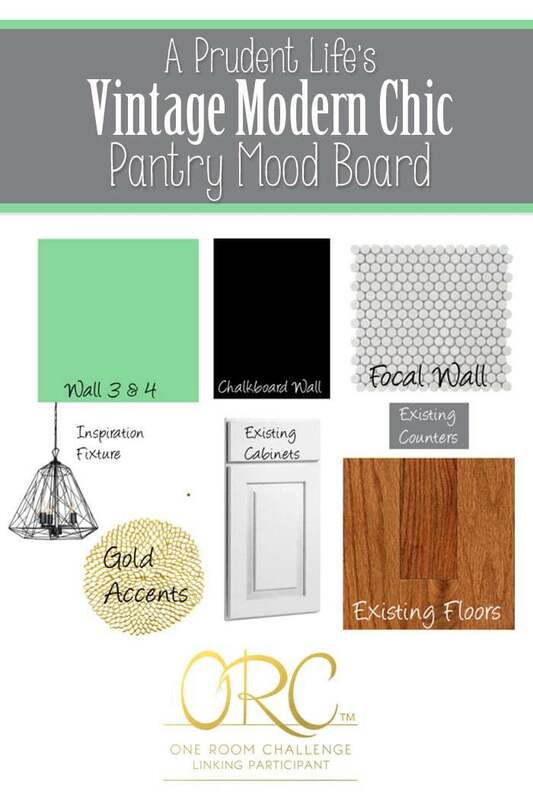 That’s going to be the prettiest pantry ever when you’re done! I love your plan! Thank you Sam! I’m just finishing up the chalkboard wall and I’m in love already. I can’t wait to get the tile up! 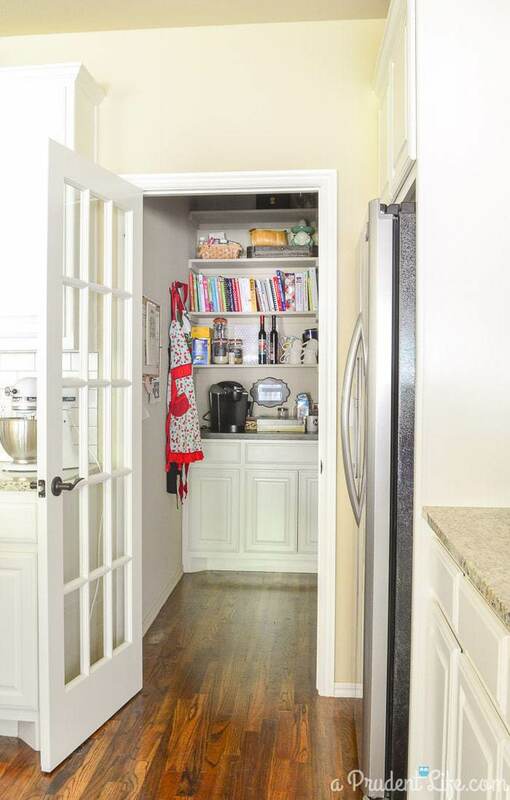 I have always wanted a walk-in pantry. You are right, it is like a mini kitchen. Can’t wait to see this come together. That is a long list. Good luck. Thanks do much Linda! 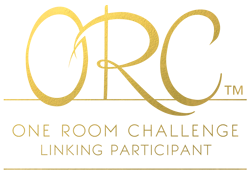 This is such a great challenge that you coordinate! This is an awesome room to give a makeover too!! It already looks great in the first place. 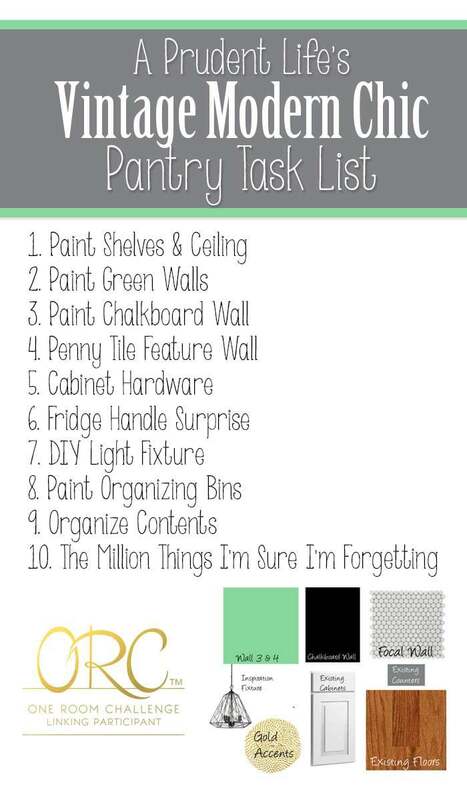 The colors you picked out are going to be perfect for that room. This is going to end up being a pantry I’d love escaping to…is that weird? love your plan. Thank you! It’s not wierd at all considering I’ve already fantasized about having cocktails in the pantry just staring at my tiled wall. Oh this will be fun! That’s quite a good size pantry to work with. Good luck! What a great space to have. It looks like you’ve got some great building blocks and fabulous ideas! And I kind of love that you still had that ceramic snowman out. You’re in good company ; ) I’ll be following along for sure and look forward to seeing your progress. I’m also linking up, tackling my never really finished kitchen. Kitchens are so fun to design! I can’t wait to watch your progress! Wow, I never knew I could have pantry envy until now!!! This is going to be killer! Love your color choices and that light fixture! Can’t wait to see more! Thanks Kate! That light fixture has me the most nervous. I have a rough plan on how I’m going to DIY it, but I’m not entirely confident it will work. We’ll find out! ok, number one: how cool is it that your second fridge is in your pantry?! Ours is in the garage. number two: i LOVE the idea of a pantry makeover, I think I need one now too. number three: I am in love with your plan and design choices! I have a chalkboard wall in my dining room and it’s my fav!! So excited to follow this and see how it all comes together! xoxo. Thanks so much Tara! We are so thrilled with our second fridge. Plan A was to do a wine fridge under the counter. Then we realized for the same price we could do a full size and have the benefit of the extra freezer space too. 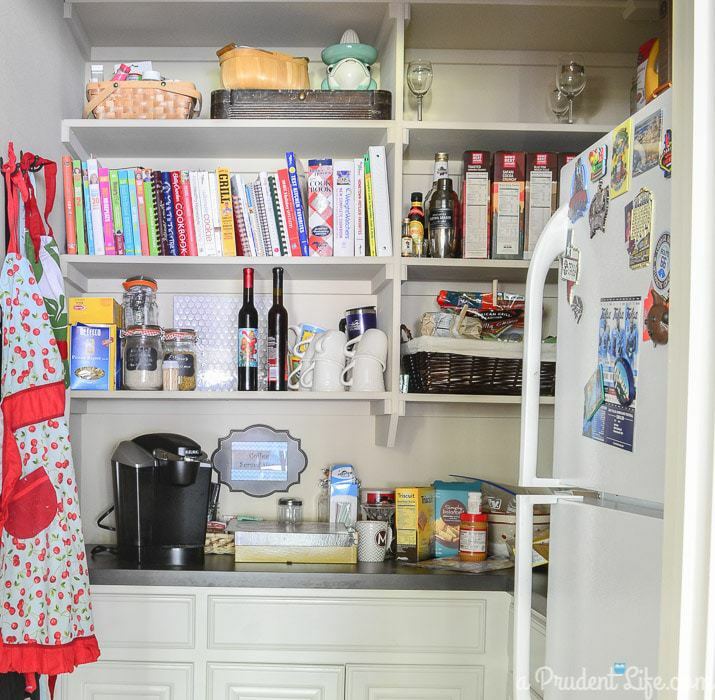 Yes, very jealous of your pantry. I love the vintage vibe you have created and can’t wait to follow along. Oh yes, Shaker Beige – I know it well (if you mean the Benjamin Moore colour.) It was very popular here too awhile ago. Yes! The BM Shaker Beige! I loved it at first because it does make all the white wood work stand out, but I’m completely over it now. Sadly, it starts in the entryway which is 25-30 ft tall and not so easy to paint. 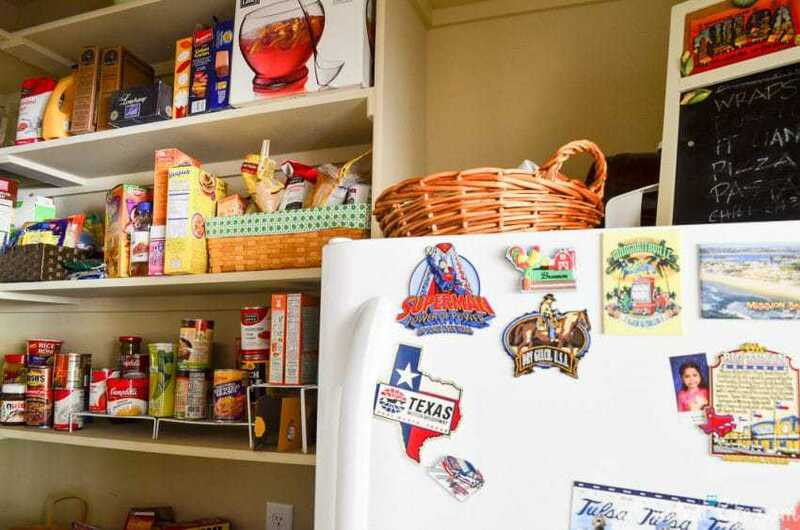 I would have bought your house just for the pantry too – it’s awesome! I’ll be dying of jealousy when it’s done – love your plans! I love that you chose a space that will be for you to enjoy. Sometimes it’s those practical and private spaces that tend to get ignored. I can’t wait to see what the painting looks like on your next post. This is so fun! I love your plans.